Non-volatile Flash memories can store data for years without refreshing them, but they write information about 1000 times slower than volatile dynamic random access memories (DRAMs).The invention presented here is a semiconductor heterostructure (quantum dot) based memory cell, in which the writing process is based on the storage of either holes or electrons, and in which the erasing process is based on the recombination of electrons and holes. 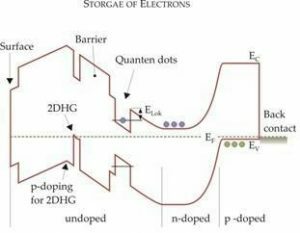 Since in these kinds of memory cells the way of storing can be switched between electron storage and hole storage, they can be used as binary storage elements. The presented memory cell is suitable for optoelectronic devices and for data storage. Computer Industry, optoelectronics, consumer electronics. Interested? Contact Us! Interested? Contact Us!